The extensive work undertaken in the late 1990’s included entirely replacing the solid teak interior; a new air-conditioning system; a complete overhaul of the superyacht’s twin Mercedes-Benz 194hp engines; a new tender and a fresh paint job. Currently lying in Majorca – her home port for the past 35 years – Greek Tycoon IV can accommodate nine guests. “The current owner isn’t using the boat and he’s really interested in getting her sold,” adds Kehoe. 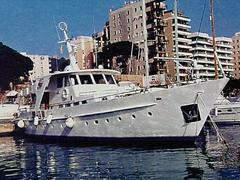 Greek Tycoon IV has an asking price of US$695,000.